Karina's Kreations: Quick Packaging Idea! Around the Christmas holiday season I find I'm always in the need for cute gift packages. Check out this quick Project. I stamped the greeting from Mingle All the Way with White Craft ink on Basic Black card stock and embossed it with Whisper White Embossing Powder. I cut out the image using the Banners Framelits. 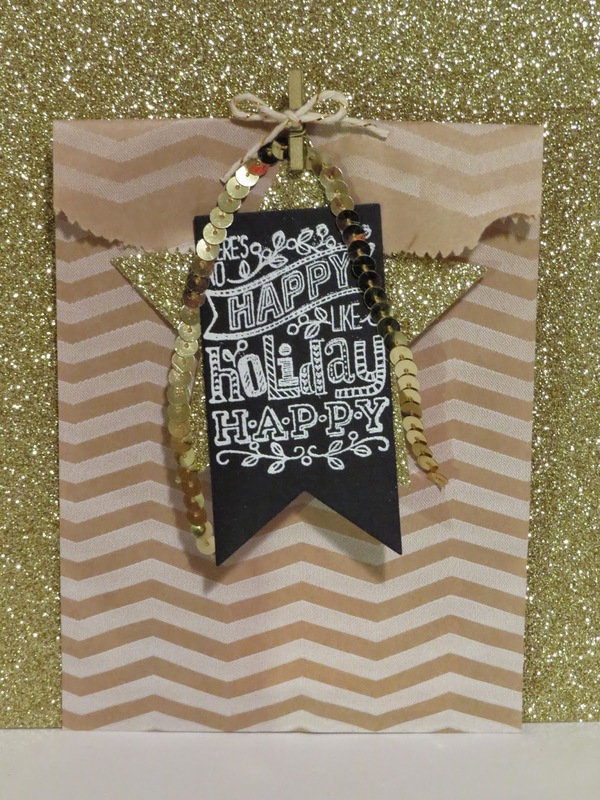 I attached the greeting to a star cut out of Gold Glimmer Paper and the Star Framelits. The tag was attached to a Chevron Tag a Bag with a Mini Metallic Clothespin and Gold Sequins. I added some Gold Baker's Twine to the Clothespin. If you're coming to my coffee talk Friday night you'll get one of these bags.